Check the RBC Avion Holiday Boutique - Free For Avioners! Valet Parking Is Worth Its Weight In Gold at Christmas! With the early snowfall in Toronto this autumn, it seems like everyone has been convinced that Christmas is right around the corner. At least that's how it seems at malls like Yorkdale Shopping Centre, where it's packed with people loaded up with shopping bags. It's literally shoulder-to-shoulder there--both inside the mall, and outside in the parking lot! 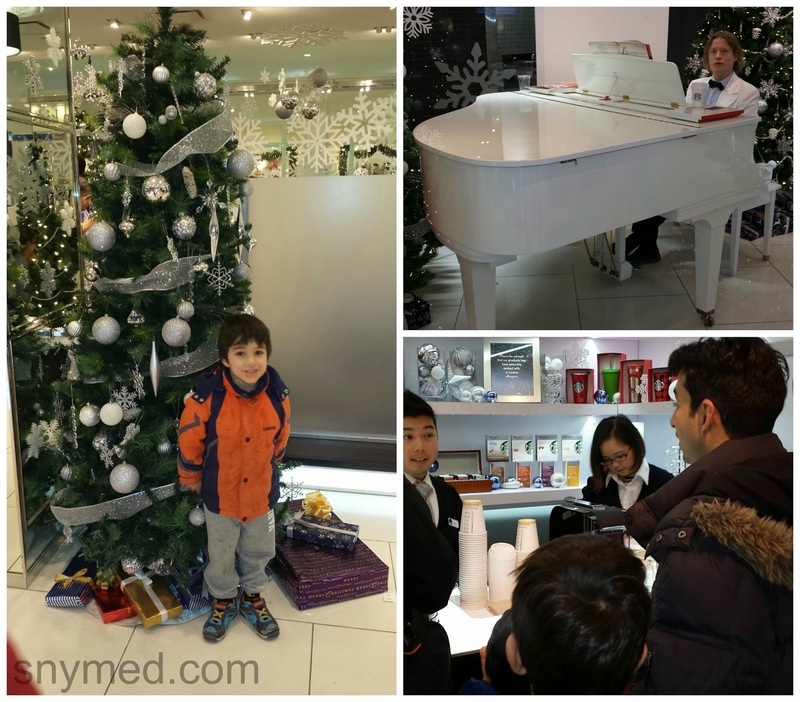 Recently my family and I had the chance to experience the RBC Avion Holiday Boutique at Yorkdale, as a respite from our holiday shopping. This is a free service for RBC Avion cardholders (Avioners). 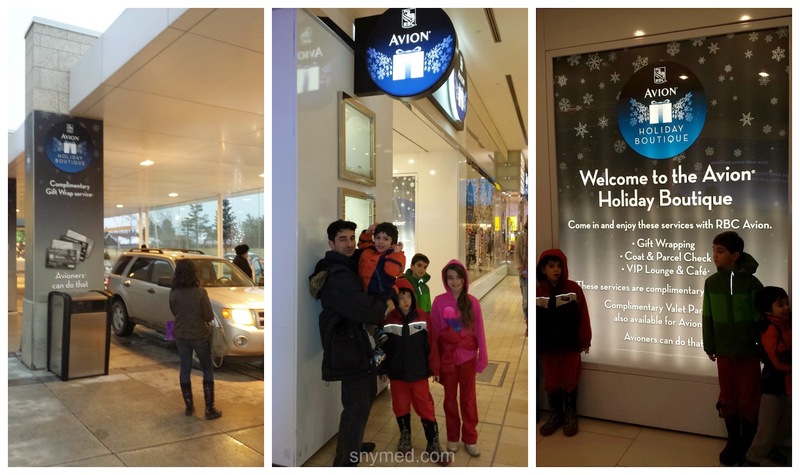 We were first treated to complimentary valet parking outside of Holt Renfrew, which was awesome, as we had all 5 of our kids in tow. As we breezed into the mall, drivers circled the parking lot like vultures looking for parking spots. 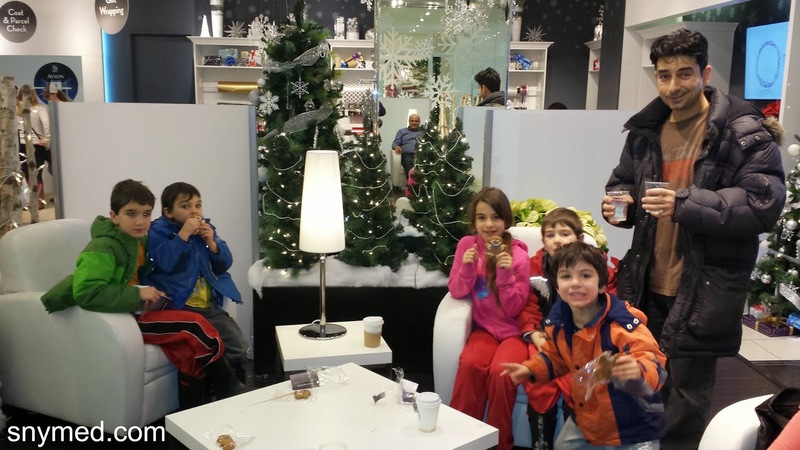 Next we did some holiday shopping inside the very busy mall, and then sailed into the RBC Avion Holiday Boutique. They offer coat and parcel check, which is a great way to take a load off. 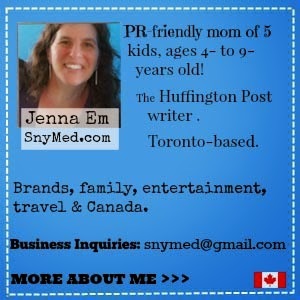 As my husband lined up with the kids at the café, I beelined over to the complimentary gift wrap station. Then, we all relaxed in the VIP lounge with hot cocoas and gingerbread men for the kids (there were also adult refreshments and nibbles). My kids were delighted. I noticed a bookshelf full of children's book for the kids to enjoy, as well as a sign that said that an iPad could be signed out for holiday entertainment purposes. I understand that the RBC Holiday Boutique also offers concierge services, although I did not try these out. My family was very pleased to take a break from holiday shopping, and understandably so. I was surprised to see how many Avioners there were--and how many were making use of the lounge. Whereas the lounge was bustling, it was in no way as busy as the mall outside its walls. I was very pleased to get a Christmas gift wrapped in the lounge, and really loved this perk which made my life easier. "The Avion Holiday Boutique is a unique and exclusive program designed to enhance the holiday shopping experience for RBC Avion cardholders at Yorkdale and Square One Shopping Centres. As well, an RBC Avion Holiday Boutique will be available in Coquitlam Centre in Coquitlam, BC and a mini Avion Holiday Boutique pop up at Halifax Shopping Centre in Halifax, NS. RBC wants to thank Avioners for their loyalty, and to help turn their holiday shopping experience from good to great!" Although the RBC Avion Holiday Boutique is for Avion cardholders, the public can enjoy the valet parking, coat and parcel check and gift wrapping services for a pre-set fee (all coat & parcel check and gift wrapping fees are donated to charity). Click for more information about the Avion Holiday Experience. Have you completed your Christmas or holiday shopping yet? Do you find that your local shopping centres are busy already? The valet parking alone is amazing! It is nearly impossible to find a parking spot at Yorkdale on weekends after 12pm in December. What a fab way to give back to their customers, am a bit jealous the cards I hold don't have those benefits. I love this perk! It takes the stress out of parking and shopping. I love going to the Avion boutique. What an amazing lounge - and a fantastic perk! I haven't even STARTED my Christmas shopping - although I found myself picking a little bit here and there so maybe I've put a dent into my list? All our shopping centers are packed, and you can already feel the Christmas spirit. LOVE it! What an awesome perk! I agree with Aeryn... the valet parking alone is AMAZING. I haven't come close to finishing my shopping yet. Hoping to this weekend! Or at least get a good amount of it finished. I also have to agree with the fellow comments the preceded. That is a wonderful perk. I found that the smaller malls are not as busy and yet had what I felt were appropriate gifts outside of ones I was fortunate to make.